Panthers head coach Ron Rivera said he expects Manhertz, Ian Thomas and fullback Alex Armah to share all the reps at tight end Sunday against the Falcons, Joe Person of The Athletic reports. Manhertz (foot) is active for Sunday's season-opening tilt against the Cowboys. Analysis: Both Manhertz and Greg Olsen (back) are active Sunday after shaking off questionable designations, giving Cam Newton his full complement of tight ends against the Cowboys. Manhertz (foot) is listed as questionable for Sunday's season opener against the Cowboys, David Newton of ESPN.com reports. Analysis: Manhertz was removed from the Physically Unable to Perform list and was a limited participant in practice this week to earn the questionable tag. The 26-year-old sustained the injury during minicamp in mid-June and is likely to serve as the Panthers' No. 3 tight end, if he's able to suit up Sunday. Manhertz (foot) passed his physical Friday and was removed form the PUP list, Bill Voth of the Panthers' official website reports. Analysis: Manhertz has been sidelined since injuring his foot during an offseason minicamp. He is expected to provide depth at tight end behind Greg Olsen and Ian Thomas, while also aiding special teams. The 26-year-old should not be targeted in the fantasy realm unless injuries occur ahead of him. Manhertz (foot) is closing in on full health, Jourdan Rodrigue of The Charlotte Observer reports. Analysis: Manhertz injured his foot during minicamp in June and started training camp on the PUP list. Once he's activated, however, Manhertz will round out the tight end corps with Greg Olsen and Ian Thomas. The 26-year-old shouldn't be considered in the fantasy realm, though, as he made just three catches for 27 yards in the last two seasons. Manhertz (foot) was placed on the Panthers' Physically Unable to Perform list Wednesday, Joe Person of The Charlotte Observer reports. Analysis: Manhertz injured his foot during minicamp and it's uncertain when he'll be ready to hit the practice field. Once healthy, Manhertz will need to fend off fourth-round rookie Ian Thomas for the No. 2 job behind starting tight end Greg Olsen. Manhertz (foot) is unlikely to be ready to return to the field when training camp opens, Bill Voth of the Panthers' official site reports. Analysis: Manhertz suffered a foot injury in minicamp and is working toward a full recovery. While the injury isn't overly severe, his absence from the start of training camp is an unfortunate development. He's expected to compete for the backup tight end role behind Greg Olsen. With Manhertz expected to miss time, look for Ian Thomas to get a chance to make the most of some extra reps early on in camp as he battles for the same slot. Manhertz injured his foot during Wednesday's minicamp practice and will get an X-ray, Jourdan Rodrigue of The Charlotte Observer reports. Analysis: Manhertz is competing with rookie fourth-round pick Ian Thomas to replace Ed Dickson (Seahawks) as Carolina's No. 2 tight end. The Panthers should have a better idea on the extent of Manhertz's injury once he gets evaluated. The Panthers have tendered a one-year to contract to Manhertz, an exclusive-rights free agent, Max Henson of the team's official site reports. Analysis: Manhertz appeared in every game during the 2017 season but most of his playing time came on special teams. 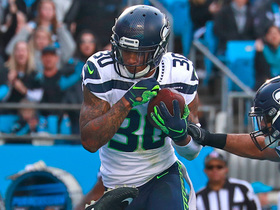 Sitting third on the tight end depth chart behind Greg Olsen and Ed Dickson, he ultimately finished the campaign with two receptions for 17 yards on four targets. However, its possible his role in the passing game could expand this upcoming season with Dickson set to become an unrestricted free agent March 14. Manhertz has a high-ankle sprain and was placed on injured reserve Tuesday, Jourdan Rodrigue of The Charlotte Observer reports. 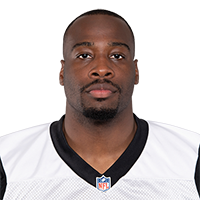 Analysis: Manhertz played all 16 games for the Panthers this season, posting two receptions on four targets for 17 yards and zero touchdowns. He was used more for his run-blocking abilities, especially since No. 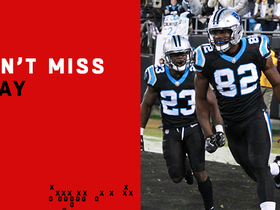 1 TE Greg Olsen is a stud in the pass-catching realm. Olsen and Ed Dickson are the two remaining healthy tight ends for Carolina for Sunday's game against the Saints. Manhertz (concussion) was a full participant at the Panthers' Friday practice, Jourdan Rodrigue of The Charlotte Observer reports. Analysis: Manhertz suffered a concussion in Sunday's victory over the Falcons, but it appears he has recovered from the issue. He looks on track to play in Week 10 barring any setbacks. Manhertz suffered a concussion Sunday against the Falcons, Jourdan Rodrigue of The Charlotte Observer reports. Analysis: Manhertz left in the first quarter of Sunday's game and won't return. The 25-year-old tight end has just one reception for 11 yards this season, as he's mainly played second fiddle to Ed Dickson.